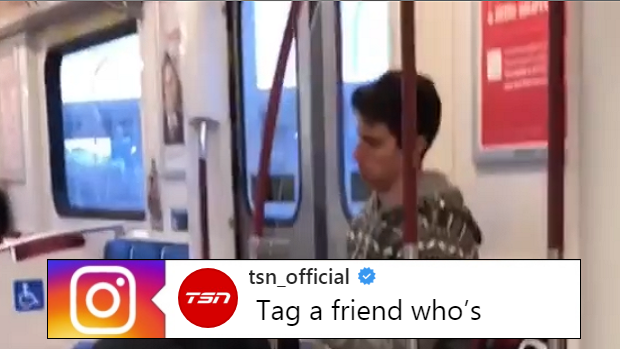 A hockey player gets dressed in his equipment on the subway. We all have the one teammate. The one who shows up late to EVERY SINGLE GAME and often is already wearing their equipment. If a player’s running really late and doesn’t even have time to get dressed at their place, then they have to go even a step further and actually prepare in the car… even the subway. One in particular who was clearly battling to make it on time was captured on the subway getting into his gear and he couldn’t have looked like he was in more of a rush. Okay, so it wasn’t some random dude but still… let’s break this down for one second. Getting into the equipment was one thing but can we talk for a second about those socks? Was Jesse actually wearing dress socks to hockey and even worse, putting them against the subway’s floor? Just a suspect decision if we’ve ever seen one. Fortunately Jesse did make it to the game, just in time to see teammate Luca Celebre make a ruckus on the ice. The guy was just calling for the puck left right and centre even when he wasn’t open. Then again, that Corwin guy isn’t a great passer either! Just one relatable problem from the next with the BarDown hockey team. If you’re running really late and have the option between driving or taking the subway then stick with the latter. You'll have more space!